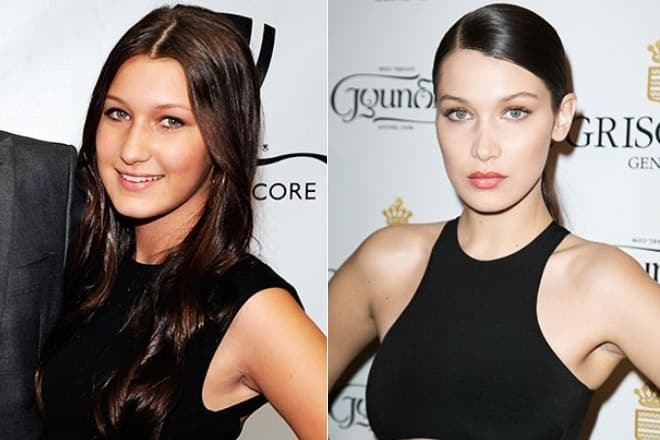 Bella Hadid before and after plastic surgeryBella Hadid is young and beautiful, she likes to appear in revealing dresses and to shock the public. The girl is ranked as a part of the jet set, but she doesn't pay attention to it, and confidently moves in the direction of the objectives that she had set for herself. Bella Hadid is a rising American model. The girl was born on the 9th of October, 1996 in Los Angeles. The girl's father is the architect with a world-famous name, the American of the Palestinian origin - Mohamed Hadid. He owns the company which builds Ritz hotels and other buildings all over the world. Bella's mother, Yolanda Foster, the Dutch model, has become famous due to the shootings in TV popular project "The Real Housewives of Beverly Hills". Bella's parents separated when the girl was only 4 years old. Children stayed to live with their mother. Their mother married the producer David Foster, the sixteen-time owner of the Grammy award. Bella had had friendly relations with her stepfather, as well as with her stepsisters, and there are many sisters – two from her father and five of them from her stepfather. Bella Hadid spent her childhood together with her elder sister Gigi and her younger brother Anwar, probably, that's why the girl has always dreamed to become a top model, as well as her sister. The girls are still friendly and similar in their appearance and it’s easy to confuse their voices. But, as Bella tells, Gigi has always been an exemplary child, she studied well at school, didn't play pranks, unlike her younger sister. The model calls herself a rebel. Somehow at school, the girl dyed her hair in brown color –she wanted to prove to people around her that she was different from others. By the words of Bella Hadid, she has always had a freedom of choice – the girl is grateful to her mother for the fact that that didn't define what to put on and how to make up. As a result, Bella created her own style, and she has become a personality. At teenage age, Bella seriously practiced equestrian sports and planned to compete at the Olympic Games of 2016, but the state of health prevented the girl from training continuation. In 2015 she was diagnosed with Lyme disease caused by the tick bite. Three years earlier the doctors diagnosed her mother and her brother with the same illness. Before beginning to work as a model on the podium, Bella Hadid worked in a cafe in Malibu for some time, then she was admitted to New York Design School and successfully graduated from the institution, she was also fond of photography. Adventurous by her nature, Hadid often appeared in the center of scandals. In summer of 2014, the girl was arrested for driving in a state of intoxication. The court deprived Bella Hadid of the right to drive for a year and was appointed 6 months of a trial period. The model career would have remained a dream if Bella hadn't had plasticity of her nose. The girl was 16 years old. With her new appearance and dark skin, the beautiful girl began to conquer the podiums. The faultless figure (with a height of 173 cm the weight of the girl reaches 50 kilos) has allowed Bella to present herself in the world of "ready - to - wear" at once. The star biography of the model started promptly. She began her career in August 2014 when Bella concluded the contract with IMG Models agency. Her sister also works in this agency. For a rather short time in model business, Bella Hadid has achieved serious success. The model participated in the fashion displays of Desigual and Tom Ford clothing collections. Then there were photo shoots and covers of many famous glossy magazines among which there are "Bazaar" and "Fashion Book" magazines. In 2015 the young model receives the award "Star Breakthrough". It was the double victory as the winner was defined by the readers of the glossy magazine. After such a successful start Bella began to be invited to take part in TV shows and to the shootings in song videos. For a year the model has taken part in four song videos. In 2016 there was released a short-length movie "Private" in which the girl had played herself. In the same year, 2016 Bella appeared at Chanel fashion displays together with her elder sister Gigi Hadid and their friend Kendall Jenner. The contract concluded with Victoria’s Secret women underwear company became the main achievement of Bella Hadid. The girl managed to participate in several photo shoots for the catalog of the firm and also appeared on the podium with wings of an angel of "Victoria's Secret". The appearance of the photo of Bella Hadid on the cover of the French "Vogue Paris" edition became one more peak of the fashion Olympus conquered by the model. The girl doesn't hesitate to bare her body on the podium, she can easily appear dressed in an unbuttoned shirt and this way she makes the journalists and the audience speak for herself. It is said, that the model would have a successful career and that Bella Hadid would surpass her sister. To promote herself Bella uses different ways of "shock therapy". In 2016 following the results of the Cannes Film Festival, there was a scandal connected with the name of the American model. The model appeared on the "red carpet" in a red satin dress with a deep decollete and a slit up to the waist. The girl didn't wear any underwear, therefore during the photoshoot, the audience saw some intimate zones of the body of the rising star. The same year at the contest of the First Annual Fashion Los Angeles Awards which was held by "Daily Front Row" magazine, Bella Hadid became the winner of the award in the nomination of "Best Model of the Year". The personal life of the model doesn't stand still. The girl regularly posts photos from vacations and parties on her Instagram. In the same year 2015, there appeared some information that the model was meeting the Canadian musician from "The Weeknd" band. The ancestors of the young R&B singer by the name of Abel Tesfaye came from Ethiopia. The relations of the model and the singer were under the close attention of the reporters. In 2015 Bella appeared in her boyfriend’s song video "In The Night". At the beginning of 2016 in the press there was information that young people had broken up, but soon the loving couple was noticed together again. By the end of the year, Abel and Bella finally separated. A month later on the Instagram page of Selena Gomez with which Bella Hadid had friendly relations there appeared her joint photos with Abel Tesfaye. At the pictures, the musician was gently kissing and embracing Selena. Bella didn't expect such blow from her friend and soon she unsubscribed from Gomez's Instagram account. Negative responses about each other, photos with mutual insults appeared in this Internet duel between the girls. The models even posted bared photos at the pages of their accounts one by one, has shown the advantages of their figures before each other. Even Gigi stood up for Bella, having reported that she would stop communicating with Selena if younger sister asked her to do this. Sometime later the passions and quarrels came to naught. In December 2017 Bella visited Dubai where she became the participant of the advertising campaign devoted to the opening of the hotel complex. For a festive event, the star chose a bright yellow Fendi dress with a deep decollete. Besides standard communication with other participants of the evening, Bella spent a lot of time in the embraces of the Spanish model Jon Kortajarena. Admirers of the model are looking forward to the moment when the couple officially announces their relationship. At the same time, the Russian rapper Egor Kreed was having his rest on Dubai where he met with Bella Hadid at the small Japanese restaurant. During some time Egor tried to draw the attention of the beauty to his person, but Bella preferred communication with her friend and colleague Elena Perminova. In everyday life, Bella prefers vintage jeans, leather biker jackets which she buys in the number of dozens. The girl doesn't love a make-up too – only red lipstick and mascara. Black is the favorite color of the model, though the model doesn't ignore bright coats, except for green – this is the color which Bella hates. In 2017 Bella Hadid participated in another show of Victoria's Secret brand where she appeared in the dress of "angel". The fashion display took place in Shanghai, the video was posted on the Internet. There were lots of reproaches towards the organizers of the party because a number of models didn't correspond to the selection criteria. The American model Bella Hadid was also criticized because the admirers of the brand noticed undisguised cellulitis of the model. The girl didn't answer these impartial responses and went to the seacoast where during special training and by means of the diet she got in a good shape. The girl posted a photo in a white bikini on Instagram and collected over one million likes. Bella hides information about her own earnings. But, as the model admits, she earns less money, than her sister. In 2016 it became known that for two participations on the podium in Sydney during the fashion display of Misha Collection brand the girl earned $400 thousand. Judging from the fact that for a year of work in Victoria’s Secret Gigi earns $2,5 million, it is possible to judge about the earnings of her younger sister who only begins cooperation with this eminent trademark.